In 1912, a Philadelphia lawyer published a most amazing collection of “Americanisms,” or English words unique to the United States, titled “An American Glossary.” His name was Richard H. Thornton. He was born in England but lived in Oregon, where he was dean of the state’s law school. This is relevant to readers in the Queen City because Thornton found many of his Americanisms in Cincinnati sources, from newspapers and books published here or in correspondence by Cincinnati residents. His book records early Cincinnati slang. Thornton was perplexed by many words we consider obvious today like apple-butter, bouncer, egg-plant, mesquite, muss and snag—all from Cincinnati sources. Less-common terms Thornton traces to Cincinnati include “big bugs,” candle-box returns, fips, swartwouting, and wire-draw. A great number of Thornton’s Americanisms are found in a book published in Cincinnati in 1831. This is the “Personal Narrative of James O. Pattie of Kentucky,” which describes the author’s overland journey to the West Coast when it was truly the Wild West. Among the words Thornton attributes to Pattie are: bluff (as in high cliffs bordering a river), cache, cordelle (a towing line), mesquite (Pattie called them “mosquito trees”), mush, pine knots, pinion pines, and sink hole. Other Cincinnati sources for Thornton were the Drake brothers, Daniel and Benjamin. Thornton cited many examples from Daniel Drake’s “Pioneer Life In Kentucky” (1870) and Benjamin Drake’s “Tales And Sketches Of The Queen City” (1838). Between the two Drake brothers, Thornton found backlog (as in a log placed behind the fire in a fireplace), barrens (desolate but treeless areas), bee-line, buckeye, cats-and-clay (primitive unbaked bricks), the phrase “knocked into a cocked hat,” cruller, doughnut, fleshy, honey-locust (the tree), husking (a fall festival), Johnny-cake, maul (split rails), pone (corn bread), rising (somewhat above), roram (hatter’s cloth), snake-poled (beat up), on the stump (politicking) and swap. A couple of the Drake brothers’ terms need a bit more explanation. “Beatomest,” for example, means “can’t be beat,” as in, “If that ain’t the beatomest thing I ever saw.” Likewise, “caution” expresses not our common meaning, but something more like “example,” as in, “Let that be a caution to you.” And “hailstorm” has nothing to do with weather, but was an alcoholic beverage “on the rocks” or with ice. Finally, Benjamin Drake bequeathed us the marvelous phrase, “rowed up Salt River,” which is very close to today’s being up a certain creek without a paddle. Today, we’d probably call Thornton’s “Big Bugs” something like “Big Wheels” or VIPs. When he talks about bouncers, it has nothing to do with nightclubs. Bouncers were armed men who forced squatters to move off private property. 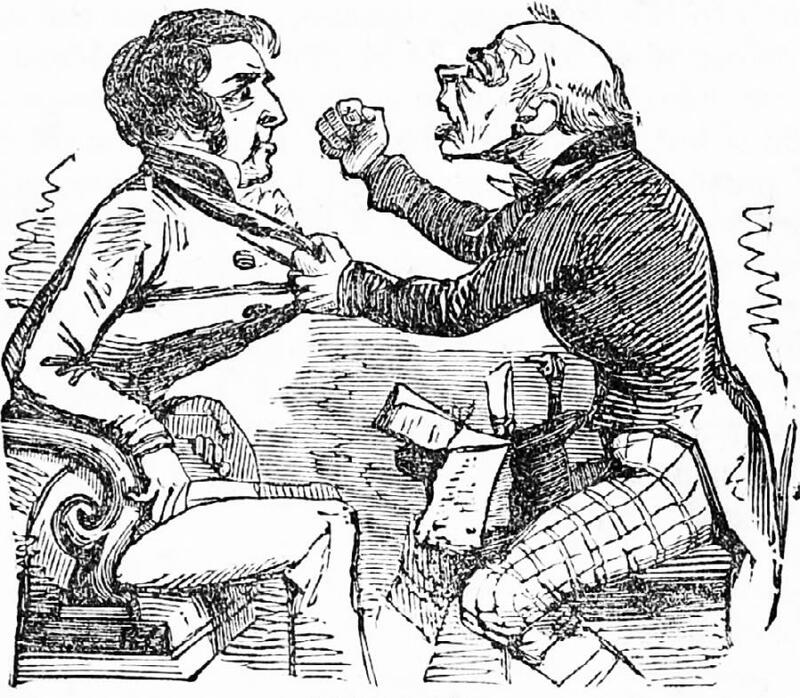 Candle-box returns are fraudulent election ballots and, although Thornton connects the term to a Cincinnati newspaper, it is based on an 1858 incident in Kansas when phony electoral documents were hidden in a candle box. “Fip” looks fairly exotic until you think of today’s “fitty,” and the terms are related. “Fip” is a five-penny coin or “bit”. When you think of half-pennies being called “hapennies,” a “fipenny” is not such a stretch. A “snag” certainly fits Cincinnati, since that was a term for a sunken tree trunk that could catch a riverboat, and there were lots of them in Cincinnati. You might not associate cheap cigars with covered wagons, but Thornton, citing Cincinnati sources, claims “stoga” or “stogie” is an abbreviation of Connestoga. “Stoga shoes” are rough farming shoes and stogies are similarly rough cigars.